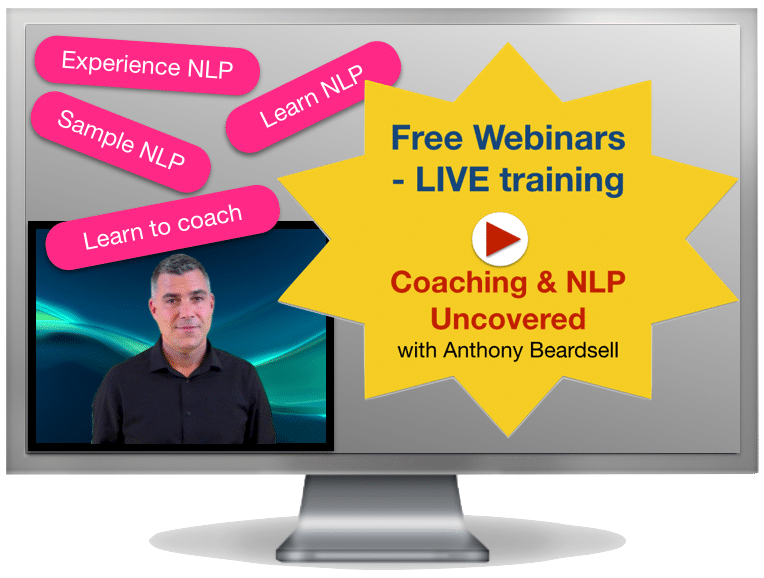 Blog » Webinar – What is NLP? How can it help me? This is the first in our Coaching & NLP Uncovered Webinar series. We begin the series with this introduction to NLP and Anthony answers two of the most commonly asked questions associated with NLP. What is NLP? How can it help me? In order to give you an example of how NLP works, Anthony asks you to bring to mind a current problem that you have in your life. Together you will explore this problem using some basic principles of NLP and some of the language strategies that NLP accommodates. Notice how your problem changes shape in your mind as Anthony guides you through some thought process exercises. NLP originated back in the early 1970s, but the knowledge that NLP incorporates nowadays has been passed down to us from the previous generations. Anthony explains a bit about the background of NLP and how it links to other fields of therapy and excellence. Using examples all the way, you will learn how Richard Bandler and John Grinder co-created NLP and based NLP upon three modelling projects that they conducted with a Psychotherapist, Family Therapist and Gestalt Therapist. Watch the video to explore the origins of NLP and the different techniques that it now houses. Discover how you can begin to create your own excellence in your chosen field by learning NLP. Congratulations Anthony on a great webinar, lots of information and clearly put across. I find Erickson’s use of metaphors great, and seeing 6-8 people a day using this method is a lot and got me thinking that he must have used the same metaphors over and over again. Can you recommend a book or source that has common metaphors and scenarios in which to adapt? I have some in my head and I find them very useful and effective and would love to have more to hand without sounding like I am trying too hard. Thanks for your feedback. Yes, I can recommend a book called “My voice will go with you.” It is written by Sidney Rosen and it is about Milton Erickson himself. It tells the metaphors that Erickson used to create change with his patients. It is an excellent read. Which NLP techniques would you use with a person, who is addicted to gambling? Have you ever solved such a case? Thanks a lot for your kind reply. Thanks for your question. Addictions must be approached carefully and are significantly more complicated than phobias, and most other unwanted behaviour patterns. One of the main reasons that they are more complicated is that the client very often feels as though there is some kind of benefit to them in continuing the addiction (in the case of gambling this perceived benefit is that they might win their money back). It is otherwise called a secondary gain. Of course this is an illusion and this is the aspect that we must deal with first of all. So, actually there may be a need to use several techniques in different stages to overcome the addiction. Timeline, swish pattern, parts integration and some hypnosis may all be necessary. I hope that this answers your question Marie. Can an NLP Practitioners coach people and to what extent can they be involved in modifying clients’ undesirable behaviour and emotional problems? Are there any legal issues involved around practising coaching? And can NLP’s clients be called “patients”? Thanks for this series of questions. Our NLP Practitioners are also jointly qualified as NLP Coaches and as such the answer is yes, they can and do coach people. Many of the techniques that our students learn at Practitioner level enable them to help people specifically with undesirable behaviour – swish pattern, anchoring, parts integration all help with that. Also Timeline work can significantly assist people with emotional problems and this is also a subject that we cover on our NLP Practitioner course. As with anything in business you should make sure that you have appropriate insurance in place before you work with clients. You should look for Professional Indemnity insurance and possibly Public Liability insurance as well if you are running a coaching practice and hosting clients. You will be able to get this type of insurance after qualifying as an NLP Practitioner and NLP Coach. I refer to the term “patients” in the webinar because Milton Erickson, Fritz Perls and Virginia Satir, who were modelled in forming NLP, were all working in the field of therapy. We generally refer to our customers as clients and consider them coaching clients. It sends a better message to them in my opinion. Mind body relationship and all that. People perceive things differently, is that what is meant by perception is projection? how long does it take to become a nlp practitioner?